Newark, Ohio was once known as "Little Chicago." As far back as the mid-19th Century, Chicago, Illinois had a reputation as an especially boisterous, unruly city. It also was a major railroad hub. Newark earned its nickname from the combination of its importance on the railways, and its many saloons, speakeasies and brothels, unauthorized boxing matches, illegal gambling, political corruption, gang activity and other shady activities. 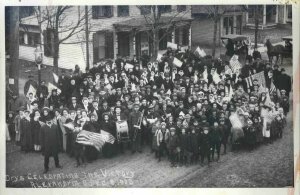 To improve the local moral climate, many residents of Newark and elsewhere in Licking County supported the Temperance Movement. Temperance advocates believed that the consumption of alcoholic drinks led to vice and other social problems. They hoped that encouraging either moderation in drinking behavior or abstinence from alcoholic drinks would result in better lives for everyone. From the early 19th century onwards, Licking Countians promoted Temperance through the work of church organizations and social clubs, and eventually the ballot box. By the late-1800's, many supporters believed that the complete prohibition of alcohol was the best solution. The nationwide Temperance and Prohibitionist movements became widely involved in politics, and as a result there were several local elections in Ohio and other states in which voters decided whether their county or township would outlaw the production and sale of alcoholic beverages. Other Licking County residents opposed Temperance, and especially Prohibition. Several persons who lived in Newark depended for their livelihood on the bottling of alcoholic beverages, or on the operation of saloons and other related businesses. Local gangsters promoted illegal gambling and prostitution at many saloons. Also, some immigrants who settled in the area came from cultures in which alcohol consumption was a deeply ingrained custom, and a significant part of fondly-held traditions. Conflicts arose in the county about whether the sale of alcohol should be prohibited. In the early 1900's, this division blended with the other social turmoil occurring in Newark to create an explosive situation. In 1908, Licking County voters as a whole approved the prohibition of the sale of alcohol in the county. Speakeasies continued to operate, though, with the Newark mayor and police chief intentionally failing to enforce the law. On July 8, 1910, deputy marshals who were serving warrants at speakeasies in Newark were attacked by a mob. One of the marshals, Carl Etherington, was lynched. In the aftermath, some of the corrupt local officials were finally forced out of their positions, mob ringleaders were prosecuted and local organizations worked at improving civic affairs. Temperance activities, although not as prominent as before, continued into at least the 1950's. This exhibit is a work in progress. If you have any pictures, artifacts or information to share, or if you have a question, please contact us at archives@lcounty.com, or tel. 740-670-5121.